Front-wheel drive gets a bad rap with car enthusiasts. You’ve heard about torque steer and “wrong-wheel drive” and might write it off as being for grocery-getters, not real performance cars. But here’s a professional stunt driver, racer and rally expert who says differently. And he has some advice. A few weeks ago I caught up with Canadian pro driver and BFGoodrich Performance Team Member Andrew Comrie-Picard, who has all those titles I just mentioned and has spent a lot of time teaching drivers to be fast with front-wheel drive cars. Whether or not the show gets picked up for more episodes remains to be seen, but what I do know is that Comrie-Picard can drive. And he’s particularly talented when it comes to making front-wheel drive cars go fast. 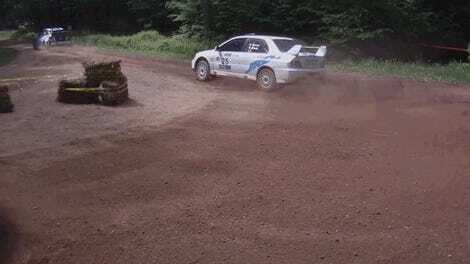 In fact, Rally Driving: The Basics, an article ACP wrote back when Mitsubishi still made viable racing cars, is still one of the most-referenced guides on how to hustle a FWD car I’ve seen around the internet. Since so many of today’s the most readily-available performance cars are FWD, and the FWD Honda Civic Type-R is just days from landing in the United States, I feel like now’s the perfect time to revisit techniques you can use to get the most out of your front-driven vehicle. What’s Wrong With FWD Anyway? ACP: “Historically, front-drive cars had a reputation for not driving well, not being great performance driving cars. They’re front-heavy, the front tires tend to get over-taxed because you’re asking them to do two things at once. The whole challenge of a front-wheel drive car is the tire’s friction circle. Because you’re asking it to steer and take a lateral load, at the same time, you’re asking it to pull you forward and accelerate, or brake, you very quickly, get to the edge of that tire’s abilities. You only have so much force that a tire contact patch can give you and remember, tire contact patch is about the size of the palm of your hand. Any time you’re flying a car through the world you’re flying it on four palms of your hand on the ground. In the case of a rear-wheel drive car, you get those two rear tires, those two rear palm-prints, they always get to push you forward, and the front tires only have to turn you side to side, and usually stop you, too, because that’s where most of the braking force happens of course. How Does A Friction Circle Work? ACP: “Draw a circle, and imagine how force vectors go: put a dot in the middle of the circle, and you get to put a certain amount of force forward or backward before you go out the edge of the circle. Draw an arrow, from the dot in the center, toward the edge of the circle, and you get that line is a consistent length. That’s accelerative force. That arrow’s pointing straight off the page, that’s pulling you forward force. If that arrow’s pointing back off the page, that’s braking or pulling-you-backwards force. If the arrow’s going straight and to the left, toward the edge of the circle, that’s a turning left force, that’s a g-force to the left. The problem becomes if you try to on 45 degrees. Imagine drawing that line, out 45 degrees to the top left. So now, you only get about half as much acceleration force and half as much cornering force before you’re outside the edge of that circle. And that circle represents the amount of traction the tire can give you. ACP: “The way we teach this in driving school is, we imagine a string, from the bottom of the steering wheel, to the top of the throttle pedal. If the steering wheel is straight ahead, you can travel the throttle pedal all the way to the ground. But as you turn that steering wheel, you have to pull the throttle up in order to accommodate that string, that’s pulling the pedal back. As you push that pedal down to the ground, that’s an effort to try to keep you in that friction circle. “If you have... a high-quality performance tire, you make that circle bigger. So that allows you to have more acceleration, more braking, and more lateral load at the same time. That’ll improve the handling characteristics of any car, but especially for front-wheel drive. Because suddenly you’ve unlocked more traction. ACP: “Now that next thing you can do (to get the most out of a front-wheel drive performance car) is start to take advantage of the fact that the car is front-engine and the front wheels are pulling you forward. The way to think about this is: race drivers often illustrate stuff with cutlery, so driving a RWD car is a little like piloting a knife. The weight distribution is pretty much the same at both ends. Push the knife forward from the tail of it, and you can move the nose back and forth, and it’s quite a balanced scenario. FWD is more like taking a spoon, take a spoon and put the bowl of the spoon forward, put your finger in the bowl of the spoon, and drag it around the table. Because the weight is all in the bowl of the spoon, where your finger’s dragging it down, and it’s dragging the rest of the car with it. Everything behind you, in fact, everything behind the engine, that’s just details. All the weight’s on the nose, all the pulling happens at the nose, and all the steering happens at the nose. ACP: “So with left-foot braking, is basically keeping the throttle wide open, and dragging the brake with your left foot to make it work a little like the hand brake. Slows down the rear wheels, and allows the car to rotate around. In fact, I just spent about 400 miles on the track with the Fiesta ST, GTI, and Type-R, Golf R, WRX STI, Civic Si, and all of those street cars, except for the Type-R, would go to limp mode. Five years ago we’d be able to pull a few fuses or sensors and be able to override it, but it’s gotten to the point where it’s extremely hard, and all the cars now are CAN-BUS wired. You can’t really trick (the car’s computer) that way (anymore). So what you want to do is control your weight transfer absolutely as well as possible. (Consider the Ford Focus ST.) ...It doesn’t have a real (limited-slip differential), but like so many of these cars now, (it) uses an electronic brake distribution control (to simulate the effect of an LSD). ACP: “It’s kind of an open secret that they do that with the rear brakes on the Focus ST. The car will automatically brake the inside wheel, just a little bit, around a hard corner which has exactly the same effect as the left-foot braking. It locks up that wheel just a little bit, and that kicks the tail of the car around. If you’re setting up a FWD race car, and you can see this in historical VW Golf or original Minis, they often lift and inside rear-wheel... Same with go-karts with solid rear axles, they’ll lift a wheel around a corner. That’s a good way to get the tail to come around. Often guys do it with very stiff sway bars, you actually need a very stiff sway bar in the front of a FWD car, but a lot of guys jack up the sway bars in the rear, and that causes there to be enough rear roll stiffness that the rear breaks early. And yes, you can make a FWD car oversteer all day long if you set it up right. But in terms of street cars, trying to drive it fast, you’re going to be relying (mostly) on two things: A really good tire, and really good OEM electronics. If you can learn to pilot a FWD car fast, you can drive anything. Mostly because, AWD cars, despite what they tell you about their symmetrical drive layout or whatever else, fundamentally drive like FWD cars. Because AWD cars fundamentally are FWD cars with RWD added. There is one exception: Nissan GT-Rs are a little different, they’re more like RWD, because they have a ridiculous transfer case, heavy, complicated. And similarly, the Ferrari FF has a whole different drive system with a crazy step-off clutch off the front. And lots of bonkers stuff. 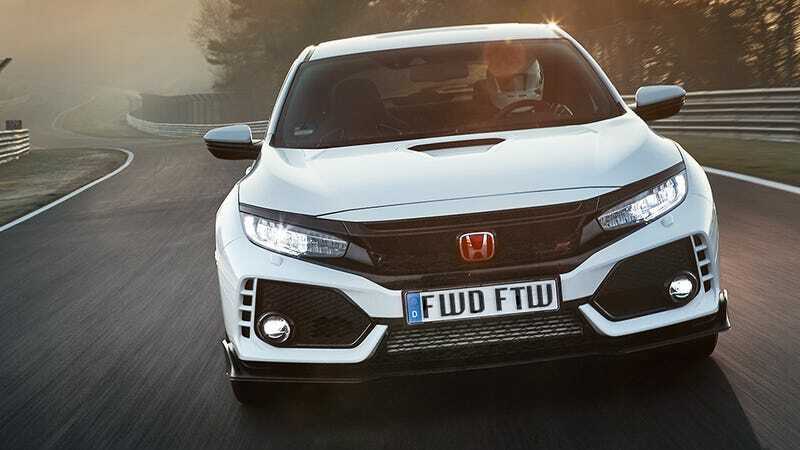 So if you’re trying to figure out how to whip your GTI, ST, Si, Type-R or anything else meant to be driven that’s got its drive wheels up front, try to digest some of ACP’s advice and put it into practice. Just remember to take it to a track if you really want to test your limits.